The consensus scientific opinion on climate change continues to show that our planet is becoming less inhabitable and more dangerous for human beings. If the rapid decline of polar bears, as well as that of a myriad of other creatures, which sustain earth’s biodiversity isn’t enough evidence to make people care or believe, 13 government agency recently revealed the fiscal impact of the devastating and inevitable change in climate. Amazon’s original stories Warmer: The Climate Changes Us All (Amazon Original, 410 pages) delivers seven stories about life in a world where climate takes a toll on human beings. This is my favorite in the collection. Raymond lives at home and cares for his elderly and infirmed mother. It’s January, and the temperature is rising to one hundred degrees. His mother has sent him out for ice cream, where he gets in trouble with a security guard for lingering too long in front of the freezer while enjoying in the frigid air. By the time he gets home, the ice cream has melted. The air conditioner in the house is controlled by Raymond’s bitter and resentful mother through voice commands. She refuses to adjust the temperature or relinquish the remote that sets the thermostat. When the remote gets damaged and can’t be replaced because of the outdated technology, he and his mother have a heated conversation that is deadly. In this story, science climatologists must cope with the horrible information of cataclysmic change, which goes ignored by government leaders and bored students. During a terrible, unseasonal storm, two scientists vying for the same university position, party like there’s no tomorrow. A high school girl lives at the edge of a lake that was once an elite community but is now under water. As a pastime, she dives into the water to find expensive treasures that were left behind. Her teacher tells her the water is toxic and she should not disturb what is submerged. The world within the lake exists only as a marker of a catastrophic historical event. Following environmental collapse, a prepubescent girl must find work to help her mother make ends meet after her beloved father — and tutor– takes his life. Soon she is on a quest to discover more about her dad, which reveal his affair with a woman in a near-by post-apocalyptic commune. Florida is sinking and a single mother is troubled after she participates in a river cleanup with her daughter’s Girl Scout troop. Soon she is haunted by the horrors of the creatures that have died from the polluted and heated waters. The everglades are dying and human beings are next. How can she cope, raise her daughter or bring another child into the world? It’s more than she can bear. Joel is a military vet whose North Carolina ancestral lands that once sustained his family were sold off by his drunkard father. Now he lives in an apartment where he struggles to make ends meet. Years before, he was the rugged poster boy for a locally made whiskey that was internationally known. When he is paid to attend a conservation expo, he finds he is a pawn in the environmental ecology game. The reign of human beings is long gone and animals have taken over the earth. It is beautiful again and the air and water are now clean. But when a group of humans emerge, the animals must decide if they will help them or stop them from multiplying. The animals remember what humans have done to the earth and do not, and cannot trust them. 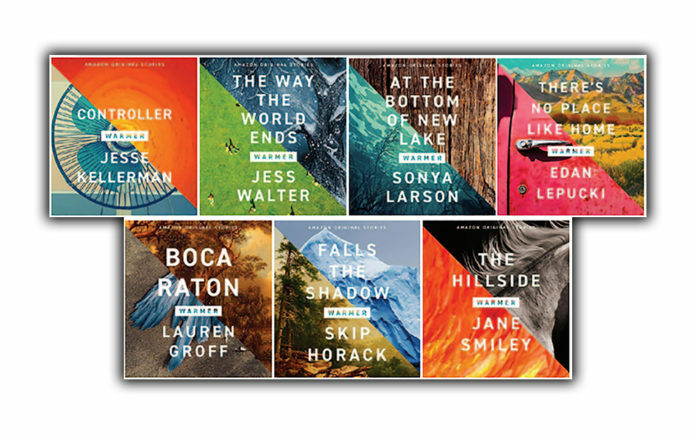 Through these seven stories, readers can imagine what life may be like as the climate continues to change and the damage becomes irreversible. The earth may certainly endure, but human kind and a multitude of species may not survive. The Warmer collection does not preach or blame, it is simply seven tales of life before, during, and after the world we currently know. The stories are filled with humor, hope and horror. Like great literary science fiction, which took us to mars and predicted a wireless future, climate-fiction warns us that humans are capable of many things that can improve life — and also destroy it.